As mayor of Baltimore, prospective Democratic presidential candidate Martin O'Malley adopted a "zero-tolerance" crime strategy modeled after that of New York City Mayor Rudy Giuliani, according to the Washington Post. O'Malley, who was mayor for just over six years, returned to Baltimore from a trip to Europe as the city deals with massive riots stemming from the death of Freddie Gray, who died while in police custody. O'Malley said he is returning to help Baltimore to "transform this moment of loss and pain into a safer, a more just future for all of Baltimore's people." That may be a political problem for O'Malley, however, as his critics say the policies he implemented created a much more assertive police force that towards the end of his administration had arrested about one-sixth of the city's population. O'Malley advocated for a zero-tolerance policing strategy as a city councilman in 1996 and fought the mayor and police commissioner at the time to implement a tough on crime policy, saying that "clearly what we are doing in Baltimore isn't working." O'Malley even led a delegation from the city council to New York to study Giuliani's strategy, which became famous for targeting petty crimes, such as "squeegee men" who would clean the windows of stopped cars and demand payment. 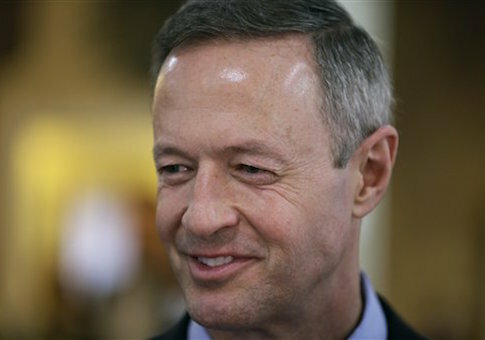 "Zero tolerance means that police are more assertive in cracking down on minor crimes, like theft," said O'Malley in 1996. "Statistics show that the perpetrators who commit minor crimes are the same people who go out and commit more serious offenses." O'Malley and his allies in the city council never got their way. Immediately after he won the 1999 Democratic primary that would make him mayor, however, O'Malley called in NYPD veterans to map out a policing strategy designed for Baltimore. The strategy was not popular among activists in the black community, including Giuliani nemesis and current MSNBC host Al Sharpton, who said the policy led "to a lot of racial profiling and harassment of black men." Sharpton also said, "It breeds mistrust when you have everyone stopped two or three times." One Baltimore lawyer characterized O'Malley's strategy as "put them in jail and figure it out later." One such arrest, in which a black 19-year-old man was arrested and held for hours for littering a candy wrapper while sitting on his grandmothers stoop, led to a lawsuit against O'Malley by the ACLU and NAACP. The lawsuit alleged that thousands had been arrested in Baltimore without probable cause, and the city eventually agreed to a settlement payment of $870,000. O'Malley often boasts that Baltimore's overall crime rate from 1999 to 2009 fell by more than any city in the country, but it is unclear whether this was a result of his policies. A new strategy adopted after O'Malley reversed course and began only targeting violent offenders rather than all offenders. By 2009 the number arrests in Baltimore fell to 77,595—and so did the number of homicides, from 269 in 2005 to 238 in 2009. This entry was posted in Issues and tagged Martin O'Malley. Bookmark the permalink.